Bernard Madoff was sentenced yesterday to 150 years in prison for investment fraud. At this point, the only people charged with a crime are Madoff and an outside accountant. Before his arrest, Madoff’s firm’s accounts showed $65 billion in assets, but only $1.2 billion have been recovered so far to return to investors. It is difficult to get a sense of scale of this fraud. One way to think of it is that the staggering 150-year sentence amounts to less than a day in prison for every million dollars missing in investors’ accounts. It seems inconceivable that only two people could have perpetrated this fraud. If prosecutors are unable to convict any other guilty parties, they would have to consider their efforts to be a failure. The latest attempt to wiggle out of pension obligations to make the news is by the Globe and Mail in contract negotiations with its 440 unionized workers. Workers have rejected the latest offer and have given their union leadership a mandate to strike. Initially, the Globe and Mail wanted to move workers from a Defined Benefit (DB) pension plan to a Defined Contribution (DC) pension plan. Later they offered to allow current workers to remain in the DB plan (with higher contributions), but new workers would go into a DC plan. If financial pressures continue to mount for the Globe and Mail, it seems likely that there will be more attempts in the future to modify pension plans to reduce costs. There are many factors that go into how much DB and DC plans actually cost a company, but the bottom line is that if the company is saving money on its pension, then retired workers, on average, must be getting lower benefits. All this can be upsetting news for the wave of baby boomers reaching retirement age, but these assaults on pensions will intensify in the coming years. This isn’t what I’d like to see happen; it is a prediction, but not a wish. 1. According to a study reported by Larry MacDonald, stocks with high media coverage underperform stocks with low media coverage (the web page with this article has disappeared since the time of writing). The next logical question is whether the media coverage causes the diminished returns, or whether for some reason the media gravitates to certain stocks because they are likely to have lower returns. 2. Despite the Bank of Canada’s promise to keep interest rates low at least until mid-2010, Canadian Capitalist reports that interest rates for consumers are going up. 3. Thicken My Wallet gives us the benefit of some experience by explaining how to pick the right business partner. 4. Preet gives us a credit card payoff calculator. Hopefully this will inspire people to pay off their high-interest debt and not cause them to give up because it will take too long. 5. Million Dollar Journey recommends an eye-opening exercise of figuring out how long your savings would last in a “worst-case scenario”. My fearless prediction is that those whose finances are the most precarious are least likely to try this exercise. 6. Big Cajun Man is relieved that the threatened Ontario-wide liquor-store strike did not materialize. In many areas, grocery stores and other big box chain stores recently began charging a nickel for plastic bags. From a rational point of view, this should not have made a big difference. However, once the initial grumbling died down, there was a huge change in customer behaviour. In our household, this nickel charge would have added a little less than a dollar a week to our grocery bill. But, the drive to save these nickels is compelling to us and seemingly to most other people as well. We bring our own bags, and when we’re forced to pay for a bag or two, we put more items in each bag. The net result has been a huge decrease in the number of plastic bags given out by stores. And this change happened almost overnight because of a tiny charge for bags. Economic incentives like this one are often a much better way of driving behaviour than setting rules. Governments serious about driving citizens to greener choices would do well to design effective economic incentives rather than imposing rules. President Obama plans to stiffen regulation of the US financial sector, and critics are calling the planned changes socialism. However, this is far from the truth. In fact, the abuses that went on before the financial collapse were undermining capitalism, and changes are needed to regain a healthy capitalist system. To understand how the financial system was undermined, we need to understand the nature of the gambles taken by financial companies. What they did was to take risks that had a high chance of a modest payoff and a low chance of a huge loss. Why did they do this? So that the individuals involved could make money. Consider the following simplified example. Imagine that an employee can take a gamble with his company’s assets that collects a $5000 premium, but has a one in a million chance of losing $10 billion. From the company’s point of view, this is a bad gamble because if we do this a million times, we will collect $5 billion in premiums, but we expect to lose $10 billion once for a net loss of $5 billion. However, things look very different from the employee’s point of view. Suppose that the employee takes this gamble 200 times per day for 250 days per year. As long as the bad outcome never happens, the company will make $250 million, and the employee can expect an 8-figure bonus at the end of the year. The employee gets to continue with these gambles collecting huge bonus cheques each year until the bad outcome finally happens and sinks the company. This is a disaster for the company, but the employee gets to walk away with tens of millions of dollars in bonuses. The best part of all this is that the employees look like they are doing a good job making all this money for the company. As long as shareholders don’t understand the risk being taken, they will be very happy with the results until the fateful day when the worst happens. Of course, it could very well be that the new regulations will go too far or will constrain the financial system too much, but this is a risk that we have to take. Two years ago a law passed requiring airlines to advertise the full price of airfares. Unfortunately, it contained a provision to delay implementation, and this delay has continued to today. There seems to be little political will to enforce such a rule despite the fact that it is popular with Canadians. So, $295 turned into $979.61, a 232% jump! If they just increased the $252 fuel surcharge a little and maybe added another surcharge or two, they could advertise flights for just $1. It has reached the point where advertised prices for flights are just meaningless. It’s high time that airlines started advertising all-in prices. Over the last 100 years, the Dow Jones Industrial Average has gone up by a factor of about 150. But this is only about half of the return because it doesn't include dividends. So you can multiply this by another large factor to get the full returns. Of course stocks have had some major blips in the last century, but this represents a relentless rise in stock prices. Even factoring out inflation, stocks have made an impressive long-term run. In the short term stocks rise because there are more buyers than sellers, and when demand outpaces supply, prices must go up. Better processes make it possible to produce goods with less effort, which frees people up to do other things and make other goods. This ability to do more with less means that the sum total of all the things we can produce rises over the years, and this is reflected in stock market prices. Some details of Obama’s plans for sweeping reform of financial regulations are now out. Even the full report lacks detail because of the scope of the reforms. It’s hard to figure out what effect all this will have on individual investors. The goals seem to be to prevent large financial disasters like the one the US is now pulling out of and to increase consumer protections. Not surprisingly, commentators disagree on whether these reforms will achieve these goals. One of the more interesting things I found on this topic is that Edward Yingling, President and CEO of the American Bankers Association (which represents all banks), doesn’t like the reforms. If bankers were supportive of the reforms, I would have suspected that Obama was on the wrong path. A common theme from these experts is that “the devil is in the details.” There just isn’t enough information available yet to know what specific new regulations will be put in place to make investing in the US safer. Even when changes will benefit the vast majority of people, there will still be an unhappy majority who oppose the changes. Here’s hoping that Obama’s changes get adopted and that they actually do help the majority of people. Until recently, if you accumulated points in some sort of loyalty program (like frequent flier points) while on business you were supposed to declare the value of these points as income. I doubt that many people actually declared this “income”. This was one of those rules that make a criminal out of many people who just didn’t bother to do the accounting (assuming they were aware of the rule in the first place). For most business travelers, the value of such points is fairly low and there was very little point in figuring it all out. - the plan or arrangement is not for tax avoidance purposes. I’m not 100% sure how these new rules would be interpreted, but it seems that the majority of people who collect points on business travel will no longer be required to declare the income. Recently, the Wealthy Boomer discussed the investment ideas of Zvi Bodie, a Boston University finance professor (the web page with this article has disappeared since the time of writing). Bodie advocates investing 100% of assets in inflation-protected bonds called Real Return Bonds in Canada and TIPS (Treasury Inflation-Protected Securities) in the US. These bonds pay a guaranteed rate of return on top of inflation. However, this guaranteed rate is quite low. Bodie uses 2% as a long-term estimate. The attraction is that these bonds are very safe even from inflation. Bodie uses the example of saving 100 kopecks per year for 40 years, and then withdrawing an inflation-adjusted 280 kopecks per year for 30 years of retirement. All this comes with no worries about stock returns or inflation. This sounds appealing, but it’s worth looking a little closer. To save for 40 years before retiring at age 65 means saving starting at age 25. I’m all for starting to save for retirement early, but realistically, few people start saving serious amounts for retirement at age 25. Instead of talking about kopecks, let’s try dollars. Let’s say that a 35-year old worker Wanda saves $5000 per year (after tax) in a Tax-Free Savings account (TFSA). We’ll assume that Wanda does this for 30 years and that the amount saved each year rises with inflation. Wanda never touches this retirement money for 30 years and earns 2% above inflation each year. How much can she withdraw each year for 30 years starting age 65? The answer is an inflation-adjusted $9200 per year. If this doesn’t sound very good to you, then I agree. Between this and the Canada Pension Plan, Wanda probably has enough for rent and food, but not much else. What if Wanda rolled the dice and invested in a mixture of stocks and bonds and earned average compound returns of 5% over inflation? In this case she’d be able to withdraw over $22,000 per year for 30 years. Of course there is no guarantee that anyone would average 5% over inflation. Wanda might instead have better or worse returns. To avoid this risk, she could just resign herself to the guaranteed $9200 per year, but this isn’t very appealing either. The truth is that most people won’t manage to save even $5000 after tax each year for their retirement. They are faced with the choice of a guaranteed pittance each year during retirement using Bodie’s plan, or rolling the dice with riskier investments. My personal choice is to roll the dice. Many commentators advocate an investing strategy based on fixed percentage asset allocations among different types of stocks (large cap, small cap, domestic, foreign), bonds, cash, and possibly other things like commodities, real estate, or precious metals. This brings us to the question of what to do when assets grow beyond or shrink below their target percentages. The main debate is between rebalancing periodically based on time, such as quarterly, or rebalancing based on percentages, such as when an asset is more than 5% off its target percentage. I don’t particularly like either approach. I prefer a focus on costs. Suppose that an investor doesn’t have enough savings to qualify for low commissions on ETF purchases, and pays $25 per trade. If this investor doesn’t want to spend more than 1% on the sell and buy commissions, then all trades for rebalancing should be $5000 or more (and trades with new money should be $2500 or more). This leads to a simple rule: rebalance when the allocation of some asset class is off by at least $5000. This may mean that for small portfolios, allocations can be very far off on a percentage basis. The fact that the portfolio is small means that this is not a major problem. As new contributions come in, the balance will be improved. With this strategy, larger portfolios will be kept closer to the chosen asset allocation. As portfolios become very large (and qualify for lower commissions), a 1% rule might lead to frequent trading. In this case, the investor can switch to a rule based on a combination of trade size and deviation from the desired allocation. By this I mean that rebalancing would take place when the allocation to an asset class deviates from the desired percentage by some amount (say 5%) AND the rebalancing would involve trades of at least a minimum size (say $5000). I’m not a big fan of rebalancing at fixed times because it allow investors to ignore the need to rebalance when the stock market gets “scary”. If stocks drop by large amounts, this is the best time to rebalance. However, most investors ignore their asset allocations until stocks rebound. In this way, they miss the opportunity to profit from the plunge in stocks. Much of the value of fixed asset allocations comes from buying asset classes when they are down. Failing to do so eliminates most of the upside of the asset allocation strategy. An index investing strategy is a major threat to the mutual fund industry. When you put your money in a low cost index fund, you are no longer paying the high fees charged by actively managed funds. Each investor with $100,000 in mutual funds with a Management Expense Ratio (MER) of 2% pays $2000 per year in fees. Up that to the $500,000 you’re hoping to have one day and the fees are $10,000 per year. It is no wonder that the managers of these high cost funds are highly motivated to fight against indexing. Try typing “the case against index funds” into Google. You’ll get plenty of hits. The most amusing hit I saw was called “How to Market Against Index Funds.” At least the title makes the motivation very clear. I read through several of the articles I found while keeping an open mind about the possibility of learning about some real problems with indexing. After all, nothing is completely good or completely bad. Here are some of the main points in the case against indexing along with my thoughts. S&P 500 index funds invest in 500 of the biggest U.S. companies, and the iShares Large Cap fund holds 60 of the biggest Canadian companies. If you are concerned about owning only large companies, then there is the Vanguard Total Market ETF that holds 1200 of the largest U.S. companies plus a representative sample of the remaining stocks. If you are concerned with owning only companies from one country, then there are international index funds. Some of your money could go into low cost bond funds as well, or you could buy a bond directly. There is no reason to pay high management fees to get diversification. How much should people pay for this “steady hand”? If you have $200,000 invested in mutual funds with an average management expense ratio (MER) of 2%, then you are paying $4000 every year to have your hand held. You might consider finding some cheaper way to avoid getting panicky and making poor decisions. In summary, I’m not necessarily against active stock picking. What I am wary of is paying a high price in the form of management expenses and other fees for the services of an active fund manager. 1. To enter the draw to win a copy of Curtis M. Faith’s book Inside the Mind of the Turtles: How the World’s Best Traders Master Risk (see review here), send an email with the subject “Book” to the address shown on the upper right corner of this blog. The draw will close Sunday June 14 at noon. I will contact the winners to get (Canadian or American) postal addresses. 2. Preet explains the new “cash for clunkers” program in the US that pays people to trade in old gas-guzzlers for a fuel-efficient car. Maybe this is a business opportunity for Canadians to sell their old vehicles to Americans who want a new car, but don’t have a clunker to trade in. 3. The interest costs of borrowing stock for shorting had been mostly a mystery to me. Larry MacDonald gives several pointers to sites that explain securities lending. 4. Canadian Capitalist explains how you could be paying double withholding taxes on the dividends earned by your ETFs. 5. Frugal Trader compares features of high-end chequing accounts. The monthly fees on these accounts looks like the amount I pay per year on bank fees. 6. Big Cajun Man reports that membership in registered pension plans actually rose in Canada during 2007. It seems a safe bet that this trend reversed in the past 17 months. Much of economic theory is built on the assumption that financial returns follow the well-known Bell curve. However, there is much evidence to support the idea that the Bell curve understates the likelihood of extreme events. However, the Cauchy distribution is narrower in the middle and higher at the sides. This means that mild events are a little less likely and extreme events are more likely. 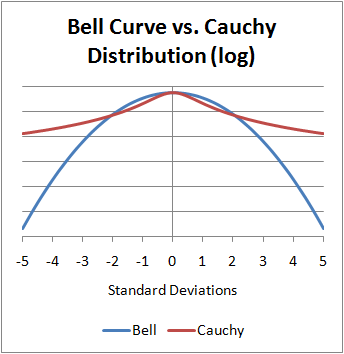 A 5-standard deviation event on the Bell curve is very unlikely, but the same event on this Cauchy distribution is about 6000 times more likely. 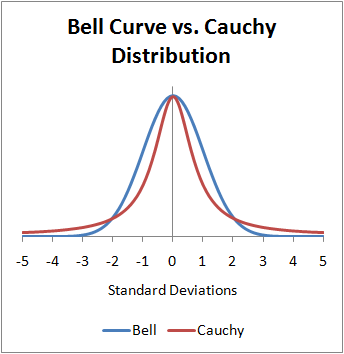 So, if a financial institution was selling insurance against unlikely events based on the Bell curve, it might charge a million dollars, but really have a 6-billion dollar exposure if the events actually follow a Cauchy distribution. It’s not hard to see the potential danger of using the wrong math to value extreme events. Of course, this danger is mostly a problem for taxpayers who bail out financial institutions. I got the chance to view an advance copy of the DVD Let’s Make Money (available June 16) from Mongrel Media. It’s a documentary about the world’s financial system and how this system has failed some desperately poor countries. I like to hear multiple opinions on important issues, but that doesn’t necessarily mean that I buy everything I hear. One thing I look for is sensible detail. Accusing an organization of wrongdoing is more credible if the accusation includes details of how things were done and what the parties had to gain from their actions. - Arrange a huge loan for the country from the World Bank. - Divert the loan to US companies to build infrastructure projects in the country. - Choose projects that benefit a few rich and powerful people in the country (so that they will agree to the deal), but not necessarily benefit the general population. - When the population is unable to repay the loan, get them to agree to deliver their natural resources, such as oil, cheaply. Perkins says that this usually works, but that he failed to convince two world leaders to accept huge loans: Omar Torrijos of Panama and Jaime Roldós of Ecuador. Perkins claims that in both cases, “jackals” were later sent in to kill these leaders. Whether all this is true is open for debate, but Perkins gives enough detail that it seems that either his account is mostly true or his story is a complete fabrication. One thing that argues in Perkins’ favour is that his recipe for extracting resources cheaply from a poor nation looks like it should work. Another interesting part of the DVD is an account of how various tax havens protect the identities of people who hold money in trusts. It’s not hard to see why some governments are concerned about losing tax revenue to off-shore trusts. Overall I found this DVD interesting and recommend it to those who have an interest in world finance and the plight of poor nations. Banks seem to be getting quite generous with credit card rewards, particularly for premium cards. However, some Members of Parliament are unhappy with the fees charged merchants to pay for these rewards. On the surface it all seems like a great idea. You buy stuff with your credit card and later you get back a percentage in cash or in points that can be used to fly of buy stuff. Premium cards are even better because the rewards are bigger. But we know there is no free lunch. Who pays for all this? To answer this question we have to follow the money for a couple of steps. To begin with, merchants are charged fees for accepting credit cards. The amount they are charged is called the credit card interchange rate. This rate is higher for premium cards. Of course, since merchants get to keep less of the money from a sale, they have to raise prices. So, ultimately, consumers’ credit card rewards are paid for by consumers. But, consumers actually pay extra because banks keep a slice of the interchange fees charged to merchants. If the interchange rate is increased by 1%, prices will have to go up by about 1% to compensate, but consumer credit card rewards will go up by less than 1%. In the big picture, consumers would be better off with a rock-bottom credit card interchange rate and no rewards. Banks have an interest in increasing interchange rates as much as possible to increase their profits. To this end they have been flooding their customers with unsolicited premium cards. Maybe merchants need to offer discounts for using either cash or credit cards with low interchange fees. When homeowners try to break a fixed-rate mortgage, they can be blind-sided by a whopping interest rate differential (IRD) penalty. It’s important to understand what you are agreeing to when you sign for a mortgage. Periodically, your bank will send you a statement telling you what your current mortgage balance is, but this balance is not an accurate reflection of your obligation to the bank. To understand this, consider the following fictitious example. Bob and Sue Ward bought a house a year ago and got a $250,000 mortgage with a 5-year fixed term at 6% interest. With a 25-year amortization, the payments were $1599.52 per month. After 5 years, the remaining mortgage balance would be $224,592. Sue’s job is moving to another city and the Wards have now sold their house. Their latest statement says that the remaining mortgage balance is $245,501. However, this figure has no connection to the Wards’ actual obligations. When they signed for their mortgage a year ago, the Wards agreed to make 60 monthly payments of $1599.52 and a lump sum of $224,592 after 5 years. A year into the mortgage, their obligation is 48 more monthly payments plus this lump sum. The remaining balance shown on their mortgage statement assumes that interest rates have remained the same. But, what if rates have dropped? Suppose that the current rate for a 4-year term is down to 4%. This means that their supposed mortgage balance is a meaningless number. What the Wards really owe is 4 years of monthly payments of $1599.52 plus the lump sum. To figure out what the Ward’s really owe, we need to find the mortgage balance that would give a monthly payment of $1599.52 and a lump sum after 4 years of $245,501 based on 4% interest. Their debt turns out to be $262,574! This is $17,073 more than the amount on their mortgage statement. Such a large interest rate differential penalty can come as quite a shock. The Wards didn’t realize it, but when they signed for their mortgage, they were betting against an interest rate drop and lost this bet. There are a number of potential complications when calculating an actual interest rate differential (IRD). Prepayment privileges, like doubled payments or yearly lump-sums, should lower the IRD. There are various ways of estimating the IRD, and most of these overstate a fair amount. For example, one might say that the bank will be missing out on 2% interest for 4 years on an average balance of about $235,000. This works out to a penalty of $18,800. This is $1727 too much. The problem with this estimate is that it takes future amounts of bank losses and doesn’t discount them before collecting them in the present. I was unable to find a description of how various banks actually calculate IRDs, although several web sites give ways to estimate the amount. The fair method that I used in the example is simple enough, and there is no excuse for using an inflated “estimate”. However, banks would rather have more money than less.